According to a posting today on Facebook from Vibram USA CEO, Tony Post, says the Bikila’s will start hitting the stores in late April. He also discusses product availability issues explaining that in Q1 they are shipping 6X last year’s volume of VFFs and that in Q2 the plan is 10X last Q2! When will the new Bikila arrive? Some of you have been running in Vibram FiveFingers since 2006 – in fact, since March of 2006 it’s the only shoe I’ve used for running. And despite all the progress we have made since our launch, we never really had a FiveFingers product designed SPECIFICALLY FOR running — until now. 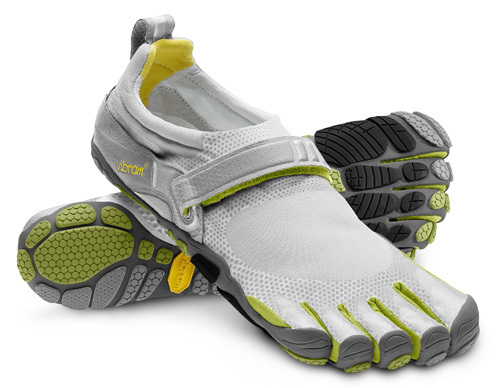 As Vibram’s #1 running product tester, I can tell you that I love this new Bikila platform – especially for longer runs. It offers a little more protection to the metatarsal heads, without compromising that barefoot sensation; the fit is secure and comfortable, and the shoe just feels FAST. Look for the new Bikila to start hitting the first stores in late April. We are flying in the first 25K pair, but I doubt we will be able to keep up with the initial demand. We ask for your patience, as we will work diligently to bring you this new product. This entry was posted on March 29, 2010 at 11:58 pm and is filed under Barefoot Running, Research. You can subscribe via RSS 2.0 feed to this post's comments.